The FALCO Liquid Separator removes liquids and mist from air streams in soil vapor extraction applications. The Separator is installed on the vacuum side of the blower to prevent liquid carryover to the blower and treatment system. The drum has a removable lid. Inside a cage provides columnar support to the drum. 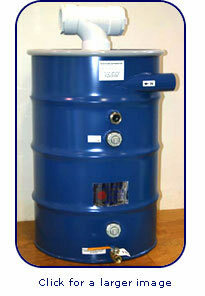 A stainless ball float shuts off inlet flow when the drum is full.